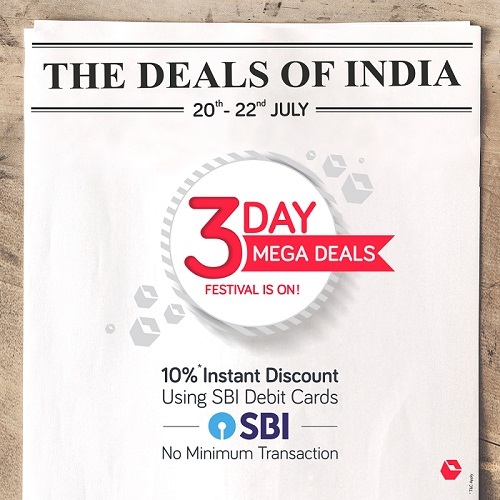 E-commerce firm Snapdeal has launched a three-day sale offering massive discounts across categories like mobile and electronics, fashion and home between July 20-22. E-commerce firm Snapdeal has launched a three-day sale offering massive discounts across categories like mobile and electronics, fashion and home between July 20-22. The company is offering discounts on various products across price segments and categories. Along with this, SBI Bank customers get an instant 10% discount on their purchase. During the sale period, the e-commerce player will be offering up to 80% discount on men and women’s clothing and minimum 50% discount on women’s handbags and accessories. The customers can purchase monsoon footwear starting at Rs 499. The sale also boasts of utility items like clothes drying stands, floaters, waterproof bike chargers, backpack rain covers, all must-haves for this season at a bargain. This year, the company has also set up a Feature Phone Store which offers feature phones from brands like Reliance Jio, Micromax, Nokia, and I Kall at attractive prices. Most mobile phones available on the Snapdeal Feature Phone Festival are 4G-enabled, and fashionably designed with unmatched features at costs starting from Rs. 299 only. These devices also come equipped with unique features such as fake currency detector, super battery feature, FM radio, music player, dual SIM, and Bluetooth connectivity. Some of these phones include IKALL K71, Nokia 105, and Micromax Bharat 1. In addition, the sale also boasts of entry-level smartphones like iVOOMi V5 and Xolo Era priced at Rs 3499 and 4499 respectively. Besides, the 32 inch HD Ready LED Vibgyor television and 40 inch smart full HD LED Television is priced at Rs 9990 and Rs 19490. The customers can also purchase safari luggage bags at a minimum 65% discount.